When it comes to choosing toys for baby, what seems like child's play is actually serious business. Playing with high-quality toys helps baby develop socially, emotionally and intellectually and teaches problem-solving skills and promotes language development. Considering the many benefits of toys, it pays to familiarize yourself with the various ways they can help your child develop and learn. How soon should you start giving baby toys for educational purposes? Babies begin learning about their world as soon as they arrive, so it's never too early to choose toys to aid in development. Encourage baby to learn by introducing age-appropriate toys within the first few days of birth. In what ways do toys help your baby's development? Toys help babies learn and develop in a five important ways. Most toys are created to encourage development in at least one of the following areas. The five senses-sight, sound, smell, taste and touch-help baby gather information about his world and process that information. 2 - Gross motor skills. Coordination of the large muscle groups, which consist of the arms, legs, back, head and neck and abdomen, enable baby to control his body and navigate his world. 3 - Fine motor skills. Development of the small muscle groups, including hands, fingers, mouth and eyes, will build hand-eye coordination. This critical area of development involves a child's ability to think, process information, learn and solve problems. A child's ability to interact with others, including display emotions and desires, helps him communicate effectively with his parents and others. As baby grows, his taste in toys will grow with him. Consult the following chart for toy ideas according to baby's developmental level. Baby enjoys looking and listening, though vision is fuzzy. Tummy time at this stage helps baby develop motor skills. Easy-to-see toys with bright, high-contrasting patterns, shapes and colors, especially in red, black and white and shiny objects or lights. Options include soft books, unbreakable mirrors, toys that make music, tummy time gyms and mats, wrist and foot rattles and musical crib mobiles. Baby's tactile skills start to develop, including the propensity to stick items in the mouth and grasp for whatever is in reach, including the feet. Head and neck control develops. Vision improves. Baby begins to recognize name and rolls over from stomach to back. Teething toys, see-through rattles, plush toys and books with board, cloth, or vinyl pages. Soft balls and blocks, toys with finger holds and items with varying textures that make sounds. Also enjoys and learns from musical CDs containing lullabies and activity gyms that make noise and flash lights. Baby starts to make noise by shaking items and banging them together. His dexterity improves, and he can pick objects off the floor and scoot on his belly until he begins crawling. Musical toys and those with surprise actions. Interactive toys that make noise when buttons are pushed or levers are pulled, movable toys, activity centers/tables and jumpers. Also learn and grow from highchair toys, bath toys and puppets and dolls. Baby crawls and may stand and walk at end of this stage, especially with assistance. Can see objects at a distance. Tosses things from hands and points to objects. Can grasp objects with thumb and first or second finger and enjoys sorting objects. Imitates others and understands short sentences. May say first word. Ring stackers, cups and blocks, including large building blocks. Sorting and nesting toys. Lightweight balls and pretend household items like telephones. Language development toys. Becomes more coordinated and shows interest in cause and effect. Copies the actions of others. Shows a sense of rhythm; likely to bounce and dance. Walks during this stage and can scribble, as well as stack blocks and empty containers. Recognizes common objects, animals and characters. And understands instructions and may like to help. Push or pull, fit-together and fill and spill toys. Shape sorters. Story picture books and simple puzzles and coloring books. Bath toys, foam numbers and letters. Play sets, musical toy instruments, rocking horse and sing-along CDs. Learns by touching various textures and exploring. Interested in doing things for themselves, such as opening doors, twisting knobs and flipping light switches. Walks well, including ascending stairs and starts to run. Can stack and build small objects. Begins using logic and reason to complete tasks like puzzles. Engages in pretend play. Roll-play toys like cars, trucks, trains, dolls and their accessories. Construction and building play sets and connecting toys. Outdoor toys like shovels, pails and sandbox. Simple ride-on toys. Pretend play toys like kitchen sets and appliances. Dress-up costumes. Sports theme toys, including those to further develop eye-hand coordination. Energy runs high at this stage as well as intellectual development. Imagination grows and they become more adventurous. They recognize sounds in their environment. They are able to dress and undress by themselves, unscrew lids and make circular strokes with pens and crayons. Gross motor skills, including running and climbing have also developed. And they begin to learn colors, numbers and letters. Art supplies. 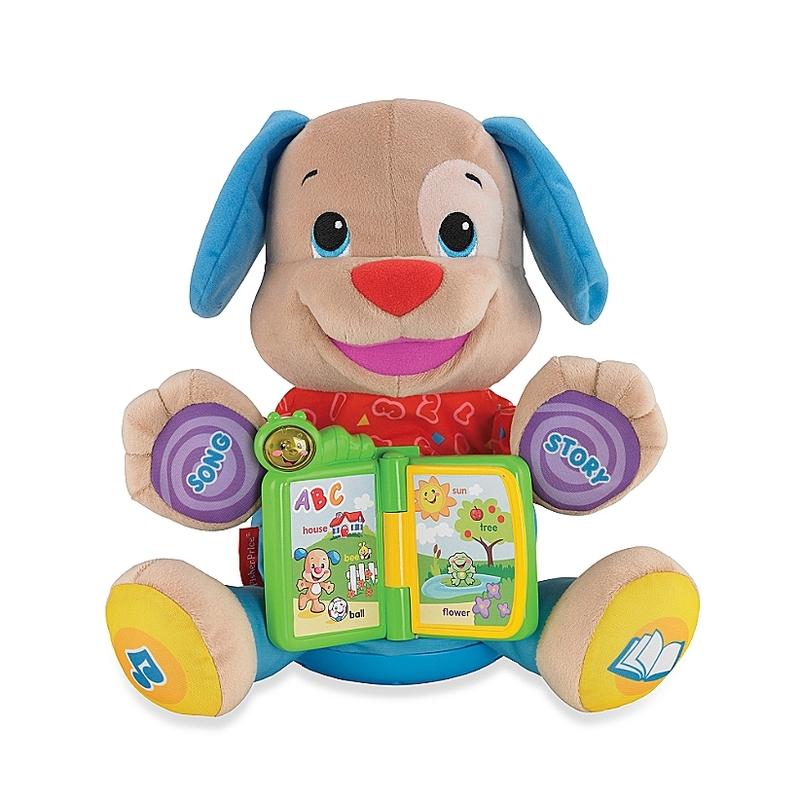 Interactive learning toys, toy laptops and electronic books and books with sounds. Toy musical instruments. Outdoor play equipment, such as slides and swings. More advanced ride-on toys like tricycles, scooters and cars. Mini sports sets/games like golf, tennis and softball. What if your baby doesn't like to play with toys that are considered age appropriate? Every child is different, with varying tastes, likes and dislikes, so certain toys may not appeal to him. Chances are, however, if you try a few different types of toys, you will eventually find one or more that he enjoys. Whatever toy you do offer baby, make sure that it is considered safe for his age. Always put your baby's safety before fun. Keep the following toy safety tips in mind. Always read and abide by the manufacturer's age and safety recommendations. Check out toys thoroughly before giving to baby, making sure there are no lose parts or rough edges. Ensure that toys can withstand chewing and there are no small parts that could break off in his mouth. Always supervise baby when he is playing with toys.